Free Attic Fan with any full house roof replacement. ABC ABC Design & Build provides exterior home improvements and remodeling in Alexandria, VA, Fairfax, VA, and throughout Northern Virginia and Washington DC. Whether you want a new roofing system to protect the interior of your home, maintenance free vinyl siding for your home’s exterior, or new gutters to eliminate leaking and overflowing gutters, we have more than two decades of experience and a reputation for providing the level of quality you deserve for your project. Shingles Curling Up – When shingles are curling up, they are susceptible to wind damage and rain may infiltrate your home. Granules Worn Away – The granules on shingles protect against water and sunlight. As the granules wear away, the shingles begin to deteriorate, which can leave your home unprotected against the elements. You may notice dark spots on the shingles or find granules in the gutters. Loose, Cracked, or Missing Shingles – Water may leak through spaces where shingles are loose or missing. Water Spots on the Ceiling – As water enters the home, you may notice water damage on the ceiling. Black or Green Streaks – This indicates that algae are growing on the roof. If the shingles are still in good shape, only cleaning may be needed. 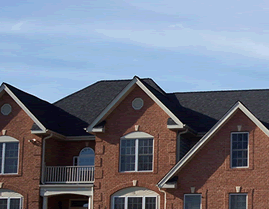 We provide roof replacement services with quality shingles to protect your investment. In general, shingle roofs may last from 10-25 years. If your home is getting older and you notice that neighbors have been replacing their roofs, it may be time to consider roof replacement. ABC Design & Build provides professional roofing services and free estimates. We offer a free Project Evaluation and Consultation, help finding the best products and a written guarantee. In addition to roofing, we offer window replacement and siding installation services to improve curb appeal, energy efficiency, and add value to your home. If you are interested in roofing, window replacement, or siding installation in the Alexandria, VA or Fairfax, VA areas, please contact ABC Design & Build for a free estimate.